Nations have their own religion , history, language and culture. They communicate these values to others via their languages. It is possible to claim that culture is the prominent value of all nations. It allows people know others easily .It mirrors their past life along with their typical character and chronological order of events. The Tulama Oromo has a multitude of cultural values like wedding & marriage, singing, dressing styles, dining, conflict resolution and so on. How conflict resolutions were effected in Tulama Oromo is the main focus area of my piece in this edition. The most common conflict resolution cultural practices in the society were guddifacha , moggaasa, siinqee, shannacha and others. For now we shall deal with ‘Siinqee’ and ‘shanacha’ . 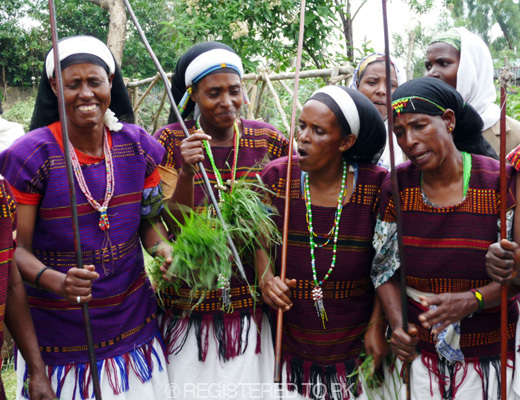 ‘Siinqee’ is an Afan Oromo word that symbolizes the thin stick females hold after marriage. It was a sign of fertility, productivity and prosperity. It had a social and religious power in Gada system. In the Gada system there was an institution of governance through which women ensure their rights to ward off the coercion and dominance of their husbands. Mothers used to give ‘Siinqee’ to their daughters during marriage so that they could ensure their rights by using it. How was this possible?What was the implication of ‘Siinqee’ in the conflict resolution culture of the society. Whenever a woman had a complaint on the way her husband treated her she would inform the case to the womenfolk in her neighborhood. Soon all women in the neighborhood gather and hold ‘Siinqee’. Then crying sing ritual songs demanding for the penalization of her husband and for the compensation to her damage. The action created tension and pressure on local elders and representative of the clan to seek ways of peaceful settlement. The women would never return home before the peaceful resolution of the conflict and without compensation. If sentenced guilty, the husband had to slaughter a bull for his wife and ask her and her friends for forgiveness. Moreover, the husband had to swear not to mistreat and abuse her his entire life. Finally, jury members explain about woman’s rights and the power of ‘Siinqee’ to attendants of the peace-brokering event. They also explain the significance of respecting woman’s rights and the social and religious problems that result from breaking the rules, tacitly embodied in ‘Siinqee’. The presence of ‘Siinqee’ in a couple’s house was believed to have religious significance. Having it at home or carrying it around was considered as a blessing. Women never failed to place ‘Siinqee’ in ‘Diinqaa dubartii’ or females bedroom, where male had no right to enter into according to ‘Siinqee’s’ rule. Whenever her husband attempted to beat her or inflict damage on her, retreating into the room, a wife would pick ‘Siinqee’ by way of defending herself. According to Tulama’s, beating a woman holding ‘Siinqee’ was tantamount to beating God of fertility and prosperity. It had also another social implication. ‘Siinqee’ was normally given to the wife by her mother to serve her protect her rights. So the man by abstaining from beating his wife that holds “Siinqee’, indirectly used to show respect to his mother in law. If he dared beat her while holding the ‘Siinqee’, it signified his disrespect for the ‘Siinqee’. The presence of women with their ‘Siinqee’ was a precondition during prayers for rain, rituals, adoption, name giving ceremonies and other religious practices. Without the presence of women with ‘Siinqee’ men regarded such events as incomplete. At marriage ceremonies parents of the bride as a blessing wipe her with ‘Siinqee’ to be fertile. They also give her cattle. Wives had to hold ‘Siinqee’ during rituals. The act showed the status and ritual power of a woman in her society. The tree, ‘Siinqee’ cut from, should have an aromatic smell.Trees like ‘ulmaayyii’, ‘Waddeessa’, ‘Harooressa’, ‘Lemmana’, and ‘Urgeessaa’ were more preferable for making ‘Siinqee’. The second type of conflict resolution culture in Tulama Oromo was ‘Shanacha’. It’s root word is ‘Shane’.It means number five. Number five had big value in the Oromo Society. Everything in the society was solved via the unity of five persons. For example there were five pillars at Gada hall that represented the period of election in the gap of eight years. The number of Gada parties were five. We have fiver fingers.’Bokkuu’, which represents the transition of power in the Gada staff, too had five elements. Namely ‘Birmajjii’, ‘Roobalee’, ‘Melbaa’, ‘Michillee’ and ‘Biifolee’. Purposely it served for counting societal and personal ages. One used to tell about himself by saying I ate one or two Gada. If somebody had eaten one Gada it meant s/he is 40. But if s/he had eaten two Gadas absolutely it meant s/he is 80 years old. As a result the number of elders, jury members responsible for examining cases and giving decisions had to be five. The number of elders that were responsible for hearing claims,legally examining cases and finally giving decisions were five. ‘Shanacha’ was a part of a legal procedure in the Gada system. Unsolved cases at ‘Shanacha’ level were referred to the ‘Salgee’ of a clan. ‘Salgee’ means the nine persons. The ‘Salgee’ were responsible and had the power to give final decision at clan level. The aforementioned practices were methods of conflict resolution of Tulama Oromo during the Gada system. The bottom line is it is doable to distill good elements from the past and blend it with modern elements for ensuring rights of people and resolving conflicts peacfully.